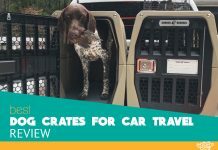 We've handpicked ten of our best-reviewed dog crates and turned it into a complete buyer's guide to make your decision a walk in the park! Are you a traveling dog owner? Or are you, perhaps, looking for a permanent-bed option for your furry friend? Either way, a quality dog crate is your best option – it will make your beloved pet feel safe, secure, and comfortable. While searching for one, it would be a wise decision to do some homework so that you can get a model that suits your own and your dog’s needs. There are many types of kennels out there, and it can be incredibly hard knowing which one would be suitable for your pet. Some people need a secure cage to confine their pets while traveling, while some may need an exercise pen to play or train their dogs. Either way, we’ve got you covered. 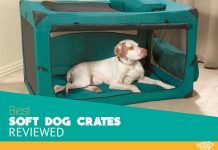 After you finish reading this article, I’m 100% sure you will find a perfect crate for your pet. As one of the sturdiest dog crates on the market, the Guardian Gear ProSelect Empire definitely deserves our Best Overall award. It’s a genuine heavy-duty kennel, with construction and weight that are guaranteed to prevent even the most aggressive canines from escaping. Every stress point on the surface of this model has undergone heavy-duty welding, and its corners have been rounded off. It is also rust-resistant, and all of these things easily turn the ProSelect Empire into a crate with the best construction quality on the market. Another thing worth mentioning is the presence of robust latches on the model’s front door. They have been constructed in a way that stops the pup from getting into contact with them. As you can already guess, this prevents even the most intelligent escape artists from getting out. We also like that the cage comes with a set of removable caster wheels (for easier transportation) and a removable steel tray (for easier cleaning). These and other features contribute to its high price, which is our only complaint about it. However, there’s an excellent value for the money here – it is, after all, the best kennel that money can buy. Want to learn more? Check out our full review here. Whether you’re starting to train a new puppy or doing the same thing with an adult dog, consider purchasing the Midwest Life model if you’re on a tight budget. This affordable folding double-door model effortlessly cuts the housebreaking time in half, and can easily reduce the behavioral issues of your canine friend. It’s an exceptionally versatile model, and one of the first things to notice about it is the divider panel. Its purpose is to allow the dog owner to conveniently adjust the length of the available space when the need arises. Adjusting the divider as the puppy grows removes the need to purchase several cages of different size, which is yet another money-saving characteristic of this kennel. For easy placement in the corner of the room or the car, the model also features double doors, which are there to allow both front and side access. This makes things a lot easier, especially if you’re a dog owner who frequently travels with this pooch. Other features worth mentioning are the satin-black electro-coat finish, slide-bolt latches, as well as the handles for carrying. For the price that it comes at, the Midwest Life is undoubtedly a steal! Want to learn more? Check out our in-depth analysis here. As the name suggests, the best thing about it is its design. Due to the fact that it can be collapsed to a height of just 8 inches, this model is incredibly portable – it’s the perfect choice for the traveling dog owners. Furthermore, it has very narrow spaces between the bars, preventing the pooch from bending them and from reaching the latches. The main build material is aluminum, so there’s no need for worrying about damage during bumpy rides. Aluminum is incredibly lightweight, so it’s pretty easy to carry it around with your hands. Other features that deserve praise are the IATA compliance, the fact that it can be bought in various colors, as well as the presence of capped corners that won’t damage your flooring. Even though this is a heavy-duty model, it is still very suitable for the traveling dog owners, which is, in our opinion, very impressive. This soft dog crate comes with a number of essential benefits. It combines a steel tube frame with durable, high-quality mesh fabric to provide your dog with an environment that’s both safe and comfortable. As the name suggests, it sports three doors – on the front, on the top, and on the side. Due to the model’s mesh walls, the interior is well-ventilated, turning this product into an excellent choice for the long car rides in the summer. There’s also a removable & washable cover, as well as some pockets that allow easy storage of the essential accessories. However, the best things about this dog box are its foldable design and the low price. The model can be folded down when needed, saving the user a lot of space during storage. Its low cost, on the other hand, makes it suitable for those on a tight budget. Pretty impressive, wouldn’t you say? Want to learn more? Check out our in–depth analysis here. The model’s high-quality stainless steel build is immediately noticeable – this is a very sturdy product, and as such successfully contains even the most aggressive canines. The material used for its manufacture is also very durable, removing the need to worry about things like corrosion or general deterioration. Every part of this product was designed with care – there’s the tight spacing between the wires, no sharp edges, and the package includes one of the most durable waterproof covers we’ve seen so far. The fact that the cover is also UV-resistant deserves special words of praise. Another thing we liked is the easy assembly, which requires no special tools and can be done for less than 10 minutes. We should also mention the model’s raised legs, which turn the cleaning process into a breeze. With its simple but sophisticated design, the Carlson secure model provides the dog with easy access and a comfortable environment. As you can see from the picture, it features see-through walls, thus allowing the owner to easily monitor his canine friend. The full steel body of this model is highly durable, and, when assembled, can easily house a dog weighing up to 120 pounds. Maintaining the hygiene is effortless, thanks to the inclusion of a removable black-colored composite pan. The compact design of this model makes it highly suitable for indoor use. Not only will it provide your pup with a safe haven for sleeping and relaxing, but will also allow you to supervise the pooch at all times. Carlson Secure is, in our opinion, the best indoor model we’ve had the chance to test so far – it’s a worthy investment and one we heartily recommend. Manufactured and sold by the Amazon brand, this roomy model offers a lot of sleeping & relaxing space for your large dog. It can also be used for house or potty training, as well as for reinforcing the boundaries and rules of your home. As the name says, the kennel can be bought in two different versions – single and double door. We’ve had the double door version on the test, which is also the one that provides easier access to the pet. Each door sports two slide-bolt latches, effortlessly containing the dog within its interior. Sturdy metal wire construction provides optimal visibility and ventilation, while its versatile divider panel allows the owner to increase or decrease the living space. The cage can also be folded for easy storage and has a strip of tiny vertical dividers at the bottom perimeter that prevents the dog’s paws from getting stuck. It is, in our opinion, the best solution for the containment of large breeds. When it comes to pet crates, MidWest is among the most trusted sellers – their models are always designed with comfort, security, and safety in mind. The same can be said for this model, which is, in our opinion, the best one you can purchase as an owner of a smaller canine. It can be bought in several different variants, with the 2-door one being the best of them. It includes things like the durable dog tray, rubber feet that protect the floor, the divider panel, as well as the strong carrying handle. 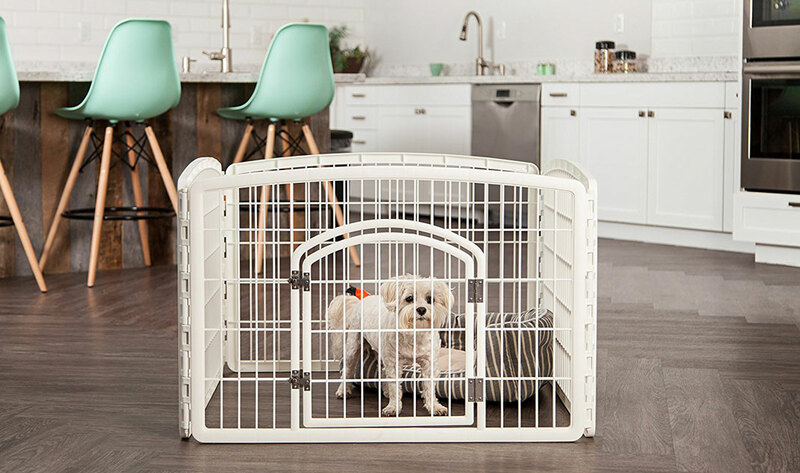 Transporting and containing your small pup is effortless with this kennel. One thing we particularly liked is the presence of a heavy-duty slide-bolt latch. It works just as advertised and keeps the pet securely contained inside the cage. With these and other perks, the MidWest’s model is an excellent choice for your Chihuahua, Dachshund, or Pomeranian. This model, the most popular dog crate manufactured by Gunner, is a fantastic option for the dog owners that travel a lot. The reasons behind this are its sturdy construction, well-ventilated interior, rubber feet, two separate locks, as well as the overall compact size. Capable of housing dogs up to 75 pounds in size, this crate features double-walled roto-molded plastic as its primary build material. The only thing you’ll need for its assembly is a screwdriver, and it takes around half an hour to put it together. The model has plenty of holes in its gate and walls, providing the pooch with a breathable environment. As we said, it also has two locks on its doors (paddle latch & sliding button), rubber feet that grip the car’s cargo floor, and a drain plug for easy cleaning. These qualities will allow you to travel with your pooch effortlessly – Gunner Kennels certainly did a good job with this model. If your dog becomes anxious once you leave the house, he is probably suffering from separation anxiety. You’ll need to get him a suitable crate for his condition, and Jespet 3 Door is one of the best choices on the market. There are three entrances on this model – on the front, on the side, and on the top. These provide easy access, breathability, and convenience sunlight. Ample ventilation allows the owner to use this model in all seasons, while the included fleece bed provides your four-legged friend with a comfortable place for relaxing. The product also has an adjustable carrying strap, a durable steel-tube frame, as well as the collapsible design for efficient storage. It’s an ideal solution for bringing your furry friend along on journeys – Jespet 3 door is a quiet, comfortable sanctuary that your anxious pet will surely love. It’s no wonder that some pet parents prefer plastic crates – it’s easy to double them as travel kennels. Adding some cushioning to Petmate Compass turns this model into a perfect haven for your four-legged companion. Fortunately, that’s not the only good thing about it. As you can see, the model features sizeable holes on its walls. These offer optimal visibility and easy supervision, but also provide the pooch with necessary ventilation in the summer months. The plastic material itself is heavy-duty and durable, so there’s no need to worry about cracking or breaking. The kennel’s door is a 2-way quick-latch model – securing it by locking it into place is exceptionally easy. The upper part can be de-attached from the lower one, and it’s also IATA complaint and usable on an airplane. If you’re searching for a plastic one, look no further – this model should meet all of your needs. First of all, they are stronger and last longer than all other types of cages. Often, they are used for containment and training of large and aggressive dogs, since they can take a lot of beating and easily stop even the strongest escape artists from escaping. Most models have strong locks and provide exceptional security. On the other hand, steel as the primary build material makes them quite heavy and hard to transport. They are not the best choice for the owners who often move the crates or those who travel frequently. Wooden dog crates are an excellent choice for those who need a sturdy model that will conveniently fit in with the decorations within the house. Unlike all other types, they have a focus on the aesthetics, with most of them being handcrafted and sporting designs that are impressive and eye-catching. Seeing them inside cars and other vehicles is highly unlikely, as they’re most commonly used indoors. Some models even double as furniture, such as the stylish end table dog crates. Not only can such a kennel house your four-legged friend, but also serve you as a nightstand! However, they’re not as practical as the other types, as they often lack some essential features. They can be very heavy and are not suitable for casual car use. In terms of style and practicality, the plastic models are somewhere in the middle, between the steel and wooden ones. The plastic materials they’re made from are often highly-developed, reliable, and sturdy, qualifying them for airline use. However, unlike the steel models, they’re not bulky and are exceptionally easy to move around, despite their sturdiness. These products are easy to pick up and place in a vehicle and then travel to your relatives or the park. They often sport a ton of useful features, such as holes for ventilation, carrying handles, double locks, and other convenient things. However, they also have some specific issues. The biggest one of them is that plastic easily absorbs smells, which makes them highly unsuitable for the owners of smelly pets. If we don’t count the build material, the dog cages can also be separated into categories based on their specific types. Some models are manufactured for indoor use only and some to be used in your backyard. There are also durable and sturdy heavy-duty models, as well as “playpens” that provide your puppy with an area for playing. Often called “dog carriers,” these are becoming more and more popular with time. They provide our four-legged companions with a cozy den-like feeling and are perfect when it comes to vacations and camping. Read our full reviews about soft-sided crates. They can be particularly useful to the owners of smaller dogs, who will find their compact size and low weight very convenient. Getting the pet in and out of a soft crate is exceptionally easy and hassle-free – there no complicated locks, only zippers. Another great thing is that these enclosures require no assembly. With no panels, hinges, locks, and screws, setting a soft model up can be done by literally anyone. Moreover, most models sport a foldable, space-saving design for easy storage. On the other hand, they are not suitable for housetraining and aggressive dogs (or those that chew a lot) as they can easily tear them apart. Outdoor dog crates are must-have for those owners whose backyards are not fenced. Their purpose is not only to prevent the dogs from escaping, but also to protect the guests in case the canine is aggressive. They offer an excellent way for the owners to provide their furry friends with exercise while still keeping them contained. Due to the fact that they’re placed outdoors, they are often very sturdy, featuring an anti-corrosive material that easily withstands all sorts of wear and tear. Furthermore, they are the most secure option available – they sport locks and hinges of the highest quality, preventing even the most creative canines from making an escape. Wooden models offer a degree of customization and can fit well with the decoration of your backyard. However, most outdoor kennels are stationary – moving them around can be particularly challenging and frustrating. See Our Top 7 Outdoor Dog Kennels and why we chose them. Indoor crates are often chosen by owners who’d like to have their dogs crate-trained. They are typically built from steel and plastic, with the steel ones being much more common and popular. They come in all sizes and with plenty of different features, depending on the manufacturer. Most of the indoor kennels have walls made out of steel wire, allowing the owner to maintain eye contact with his dog and to have him supervised at all times. The best models feature rubberized feet that prevent flooring damage once the crate is moved from one part of the room to the other. Another feature to look for in an indoor model is a collapsible design, which allows the owner to easily store it away if the pooch is spending his day outside. The most significant downside is that they’re often not as practical as their outdoor cousins, especially if we’re talking about wooden (decorative) indoor kennels. Coming home and finding out that your canine has escaped from his crate and destroyed it in the process can be very frustrating. 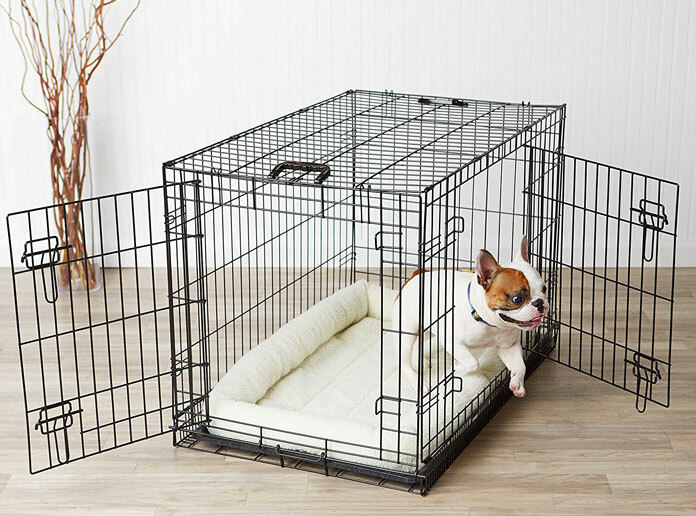 The best solution for this problem is buying a heavy-duty kennel – these Alcatraz-like crates effortlessly prevent escape-prone pups from acting mischievously. As their name suggests, they are durable, heavy, and strong enough to easily withstand any kind of an escape attempt. In most cases, they are also very spacious and can accommodate the largest breeds without giving them discomfort. They feature locks and other security systems that make it very hard for the dog to get out of them. Heavy-duty dog enclosures that are intended to be used outdoors often come with an anti-corrosion coating on their bars, removing the need to worry about wear and tear. However, due to their robust construction, these models can be quite challenging to move around. If you’d like to learn more about heavy duty cages be sure to read our full guide. Out of all types of dog enclosures, we have listed here, these provide the dog with the highest amount of freedom. Depending on the brand and model, a dog playpen can be very spacious and allow your four-footer to enjoy a sunny day while still being safely contained. Playpens are an excellent alternative for the owners who want their pups to spend time outside without having to worry about damage to their carefully manicured landscaping. Unlike the crates, these enclosures are exceptionally spacious and will let the dog jump, run, play, and relax as much as he wants. Most models come with anchors, allowing the owner to anchor them to the ground. This gives the playpen the necessary stability in case the dog is prone to vertical movement. However, depending on the size of your four-legged friend, many playpens can be climbed over, which is not something that can happen with a cage. We created a detailed guide about exercise pens for dogs so make sure to check it out if you want to know more about this type. The most significant benefit of owning a large dog kennel is pretty obvious – these types of boxes offer the most space. This, in turn, makes them an excellent choice for the owners of large breeds, who will find these enclosures suitable for the needs of their huge four-legged companions. Due to their size, these are built with durability and reliability in mind, which is precisely why they often sport things like sturdy metal walls, multiple locks, removable waste trays, and other convenient features. Some large models even offer multiple doors, providing the pooch with easier access to the interior. Since they’re much bigger than all other types of kennels, these enclosures are suited for permanent, stationary use – those who will need to move them often should look for the models with caster wheels. When you get a puppy or a small dog, you might end up surprised with how much trouble these animals can get into when they’re not monitored. Some will want their own dens to feel safe, and that is where the small dog boxes come in. Unlike their larger cousins, the small dog crates offer a lot more coziness and comfort, providing the pups with a den-like environment that they can use as a haven for sleeping and relaxing. Due to their size, these kennels are incredibly easy to move, with some even sporting a collapsible design that allows efficient storage. Unfortunately, with most of the smaller models sporting a wired construction, one can’t expect the same amount of sturdiness found in larger enclosures. Bars can bend and break, which leads to sharp points and possible injuries for your furry friend. Many people like taking their pets along for trips, and who can blame them – picnics are definitely more fun when the dogs are around! However, one can’t just put the dog in the car and be done with it. A dog owner needs to purchase a crate that will allow easy transport of his furry companion from one place to another. In our opinion, the best types of pet enclosures for this purpose are the soft dog crates (also called dog carriers). Since they use soft mesh fabric as the primary build material, they are incredibly easy to move around. Moreover, they provide the pooch with a very comfortable interior and often sport storage pockets for various accessories, such as water bottles. However, these are not the best choice if your pooch is aggressive or likes to chew a lot. For such canines, you will need something a bit sturdier, like a small kennel with steel wire walls. Letting the dog roam around the moving vehicle can be dangerous for both him and the owner. In case of an accident, the dog will become a projectile and injure himself, the driver, and the passengers. Fortunately, today’s market offers products that are highly suitable for car use. As we said, the soft dog carriers are among the best options, as they offer a lot of comforts and are very easy to carry around. They’re great for short trips, like going to the park or your relatives, but what about longer journeys? This is when the crash-tested models come into play. These models are next to indestructible and should protect your furry companion from severe injuries in case of a car accident. They are safety-tested and provide pets with a pleasant riding experience no matter the distance. When bringing a dog on an airplane, an owner has a lot of things to keep in mind. The pet’s cage, however, is the most essential element – it has to be an approved model and one that will provide his furry friend with pleasant flying experience. First of all, the kennel needs to be IATA compliant. Most of the world’s airlines will require you to possess a model that offers plenty of ventilation, stays stable during landing and takeoff, provides visibility for the airplane staff, and other things. In our opinion, the best dog crates for airplanes are the plastic ones. They sport a robust built, have a breathable interior, and most models come with the necessary IATA certification. The only bad thing is that plastic absorbs bad smells, but that shouldn’t be a big issue for the owners who care about the hygiene of their pets. Just like humans, the dogs can also experience anxiety in some very stressful circumstances. They can get nervous when the owner is trying to put them into a confined place, such as the dog crate. The trick is, of course, in purchasing a model that’s suitable enough for a worried dog. As far as we’re concerned, the soft-sided models are your best option. Unlike the hard shell models, a soft kennel won’t spook your four-legged friend so easily. Plastic and steel models often come with uncomfortable interiors and the noise they make during opening and closing easily sets the pup’s nerves on edge. To make things even less stressful, try putting treats, toys, and some worn clothing into your dog’s soft carrier. He’ll have toys to play with and the clothes scent will comfort him in case of anxiety. Each breed of dog is different and comes with its own needs and requirements. One can’t really expect to successfully use the same kind for a Labrador puppy and an adult German Shepherd – these canines are different and require different enclosures. Strong, agile, and ferociously loyal to their owners, the German Shepherds are one of the most beloved breeds of dogs on the planet. Along with the strength, their possible tendency to escape is one of the reasons why the owners need to purchase durable and reliable crates for their German Shepherds. In other words, selecting a model that’s virtually indestructible is the best solution – steel bars, heavy-duty steel frame, and multiple locks will stop even the most determined members of this breed from making an escape. For that matter, heavy-duty steel kennels are the best choice for the owners of German Shepherds. However, these products also come with a couple of downsides. The most significant one of them is that they’re quite hard to move around since they’re intended to be used as stationary dog crates. What constitutes the best model for one Labrador doesn’t have to be the same for another. However, we can safely say that this breed doesn’t like the tight, confined spaces of plastic models, and also that they don’t require large, heavy-duty enclosures like the German Shepherds. For that matter, a 42” model with steel wire walls should be quite sufficient. This kind of a dog kennel will provide you with eye-to-contact with your Labrador and will allow you to easily supervise him at all times. Most of these dogs are not excessive chewers, so you won’t have to worry about any severe damage to the kennel’s walls. We advise you to get a model with two doors, for easier accessibility, as well as with a removable potty tray that will make the whole cleaning business a lot easier. The choice of a kennel for a Pit Bull should depend on the dog’s size, age, and temperament. What works for one Pitbull may not work for another, as these dogs can be as energetic as they’re lazy. However, we think that a quality wired model is the most realistic option for an owner of a Pitbull. These products are structurally sound and should keep the dog safely contained. This might not work for the very aggressive Pit Bulls, though – they could separate the non-welded corners with teeth and make a hole for escaping. For the Pit Bulls of this temperament, a heavy-duty model is a better solution. Made out of galvanized steel and having all parts welded, such a cage is guaranteed to stop even the biggest escape artists from realizing their plans. Using a crate of perfect size will allow your canine friend to feel comfortable, secure, and safe. However, no breed is of the same size, which makes choosing the ideal-sized model quite challenging. Have no worries – we’ll teach you how to measure your four-legged friend and find him a kennel of the proper size. Read our Dog Crate Size Breed Chart. What is the Minimum Height Required? Choosing the dog cage of the correct size is of crucial importance. Buying one that’s too big can cause the puppy to use one section of it as his toilet, impeding your attempts at potty training. Purchasing a kennel that’s too small, on the other hand, will lead your pooch to spend time in a cramped space, and you definitely don’t want that to happen. Finding the correct height is as important as finding the proper length. As we said, you will have to measure your pooch and add at least 25% of the height to the obtained measurement. The given number will show you the minimum required height of your pup’s new safe place. With a model of a proper size, your four-legged friend will be able to stand, sit, and turn around for 360 degrees without any issues. Adequate comfort is essential – make sure to provide your pet with it. When buying an indoor or outdoor enclosure for his pet, some dog owners get pretty confused – the market offers crates, kennels, and carriers. What are the differences between these products? Aren’t they all the same thing? Even though the terms are used interchangeably and all types have the same purpose (keeping the dog contained), there are still some slight differences between each variant. Unlike the two other types, these are the first thing people think about when someone mentions a “dog enclosure.” They can be made out of various materials, such as steel wire, soft mesh fabric, galvanized steel, hard plastics, wood, and others. They are not as large as the kennels, and are, therefore, suitable for indoor use. Perfect for medium-sized breeds, these items can be seen everywhere – inside the living room, the backyard, in the car, at a picnic, and many other places. They are the most versatile type of dog enclosures, and, depending on the specific type, can be used for potty training, for pets with separation anxiety, as well as safe havens where canines can sleep and relax. The dog kennels, on the other hand, are bigger and therefore most commonly used for large breeds, such as Mastiff or Great Dane. Due to their durable construction, they are often used outdoors – the owners use them to keep their large dogs contained in the backyard. These enclosures are also the hardest to escape from, as they feature thick bars and multiple locks. The most expensive models come with built-in houses and have food and water bowls attached to their walls. Even though the dog carriers can also be made from plastic, the term usually encompasses models made out of soft materials. As the name suggests, they are a perfect choice for the traveling pet owners due to their high mobility and portability. Typically, they even sport storage pockets for the travel necessities, such as water bottles and various snacks. The difference between these pet enclosures should be much clearer now – try to obtain one that suits the dog’s and your own needs the best. The most significant advantage of a playpen is the modularity you get with it. As you can already guess, the owner can quickly change the shape of the playpen in almost any way he wants – square, rectangle, octagonal shape, and others. This will provide the pooch with a sizeable area for playing, sleeping, and relaxing. The biggest downside is that they’re not the most suitable choice when it comes to housebreaking. Moreover, the walls of some models are quite low, and the more determined pups can easily exploit this error. Should I Buy an Extender? The fact that your tall dog fits inside his extra-large crate doesn’t mean that he’ll be able to go on an airplane with you. If his ears or the head is touching the ceiling of the kennel, you’ll have to leave him behind. Why is that? When traveling internationally, IATA (International Air Transport Association) requires at least 3″ of clearance above the tip of the pup’s ears. Only the models that fulfill this requirement are allowed on airplanes – it is to ensure the dog’s safety and comfort during the long rides. Fortunately, you won’t have to purchase an entirely new product if the one you currently have does not meet the requirements. The extender kits, sold by most manufacturers of pet equipment, can successfully address this problem. An extender can keep your model in compliance with the regulations and allow you to take your pooch with you on an airplane. How to Make Your Pet Cage Quieter? An emotional farewell is sure to leave your pooch distressed, leading him to whine and bark until you get back home. A tired pooch doesn’t have enough energy for barking. Play with him and take him for walks, making him want to sleep as soon as he’s back inside the crate. Your canine friend needs to feel safe when you’re not around. Placing his new enclosure inside an unfamiliar room certainly won’t help. Consider buying a comfort or ball toy for your four-legged friend – it will keep him distracted and make him less anxious. Try to get one of those toys that pop out treats when chewed in the right way. With these tips in mind, you should be able to keep down the noise by making your pet feel more relaxed. Good luck! How to Train Your Dog to Use a Kennel? There are a plethora of reasons because of which one would want to train his four-legged friend. An indoor kennel can be of great value when it comes to housebreaking or potty training, and it also presents an excellent way to transport your furry companion. Moreover, the dog can use it as his safe space when he’s scared or anxious. The worst way in which you could introduce your puppy to his new crate is to immediately lock him inside it. The key is in the casual introduction – place the cage in a good spot and add some blankets and toys. In that way, the pooch will have a chance to explore the place on his own. Encourage him to get inside by placing some treats inside the kennel. To make the dog comfortable with staying inside the cage for longer periods, you could start putting his meals inside of it. Place them all the way at the back so that he goes all the way in. Once the pooch is completely inside and eating, close the door. Open it as soon as he’s done with the meal, and gradually increase the locked time by adding a couple of minutes each day. To increase the dog’s time inside the cage, use his favorite toys and treats. Hang out by the crate and go to a different room to see how he’s behaving when left alone in the kennel. Encourage the dog to get inside and give him praises every time he does so. How to Soundproof a Pet Cage? When blocking sounds, one tries to seal even the smallest holes on the object he’s trying to soundproof. Of course, this is not possible with pet cages – your dog has to breathe. However, it is still possible to increase the crate’s sound-absorbing potential and decrease the amount of noise coming from it. One can do this by purchasing some covers, especially the soundproof ones. Typically, these are readily available online and come at affordable prices. Using absorption sheets is another great way, as these can successfully deaden the barking noise coming from your pooch. Another choice would be to buy some acoustic tiles and use them on the walls of the cage. They are made from recycled cotton materials and are among the best sound absorbers. Alternatively, one can also try to soundproof the walls of the room, in case the neighbors are bothered by the noise your dog is making. A lot of people flinch in horror when someone mentions “locking the dog in a crate.” An important thing to say here is that our canine friends have a natural denning instinct and that small and enclosed spaces give them a sense of safety and security. Moreover, a dog kennel that’s used correctly is far from cruel and actually provides both the dog and his owner with a number of benefits. It’s not just a useful tool when it comes to house training but can also keep the pooch safe at home and during the long car rides. It can prevent the bad habits from forming and provide the pup with a safe space he can retreat to when he’s feeling scared or anxious. It quickly becomes the only place in the house which is not stepped over by people – areas with a lot of traffic are not what dogs are looking for when they want to sleep or relax. Another great thing is that they provide the owner with easy supervision. This is especially useful during the young and adolescent stages, as that’s when the puppies get into trouble when left alone. A dog cage is only cruel if the dog’s owner uses it cruelly. It’s not the tool that’s cruel, but the person using it in that way. The cage dryers definitely have their own special place in the grooming world. These handy devices come in three different variants – heated cage dryers, box dryers, and ambient air dryers. Heated cage dryers are, in most cases, hanged on the frontal part of the kennel. When used properly, they are very effective and valuable. The box dryers, on the other hand, are cabinets with glassed fronts and enclosed sides, in which the heated air is blowing and drying the canine. They usually have things like timers and thermostatic controls. And lastly, the ambient air dryers feature no heating elements but rather use the moving air and ambient air temperature to dry the dogs. If your pet’s cage is situated in a colder environment during a cold winter, consider getting a heating pad. Suitable for both dogs and cats, these items can be used in crates and on floors and provide the pets with a necessary warmness that allows pleasant sleeping. Most models are electric-powered and are made out of durable materials that easily withstand chewing and clawing. There are many different shapes and patterns available, providing the dog owner with a degree of customization. 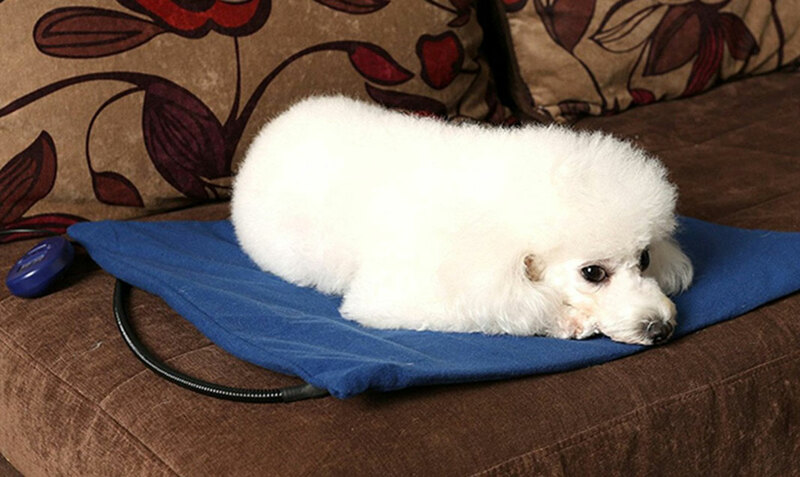 Due to the warmth and comfort that they offer, the heating pads can keep the dog secure and warm all year long – it’s one of the best additions an owner can get for his pet. Even though the cage hammocks are more suitable for cats and smaller animals, they can still be used for dogs of smaller breeds. Just like the previously mentioned heating pads, a hammock can provide your pet with a comfy spot for resting. The fact that they’re hanging makes them perfect for pets that always search for high places when they’re in need of sleep or relaxing. The market offers a myriad of different brands and models, coming in all shapes and made out of various materials. In our opinion, the best ones are those that can be quickly attached via the included spring clips – setting them up is quick and hassle-free. In case a heating bed is insufficient for keeping your pooch warm, consider getting a pet cage heater. These come in all shapes and sizes, but most are mounted to the side of the kennel and produce hot air that keeps the pet warm. They are either AC or battery operated, have built-in thermometers, and are often whisper-quiet. The fans, on the other hand, also offer quiet operation but have a different purpose – to keep pets cool. We advise getting a model with a retractable grip and several different operational speeds. Due to their small size, the interiors of some dog crates can become excessively warm during hot summers. As you can already guess, this is not good for the dog’s health, especially if he’s of a breed that’s prone to overheating. Fortunately, an owner can easily purchase a special air conditioner for his pet’s cage. These work just like the regular air conditioners – they pump in the cold air and keep your four-legged companion cool and calm. Unlike the fans, these devices are a bit more expensive – if you’re on a tight budget, you’ll have to find another way to keep your furry friend cold. Insulated dog covers have the purpose of turning the dog kennel into a cozy spot during colder months. If you’re an owner of a canine who loves traveling with you in the car, you probably know how cold he can get during January or February rides. Tucked into a crate that’s coated with an insulated cover will allow your pooch to stay warm no matter the outside temperature. Outdoor enthusiasts and dog sports competitors will find these covers useful too – they are of great help when it comes to keeping the dogs warmed up and ready to go. Most models come with multiple pockets, and these can be used for storage of water bottles, treats, and other things. However, these should be used only with canines that are not excessive chewers – an aggressive or stressful pup can easily damage a cover beyond repair. A divider panel is among the most versatile accessories you could get for your pet’s enclosure. 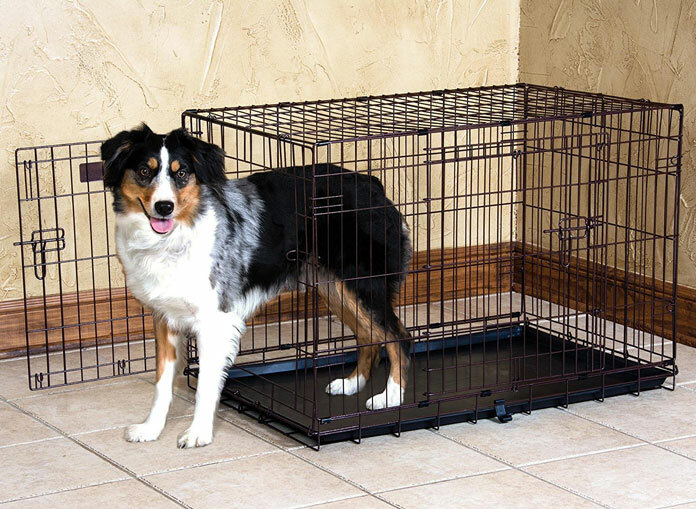 First of all, it can save you a lot of money – the owners of two pups can use it to divide the crate instead of buying two separate enclosures. It can also be used to segregate the kennel so that the pooch doesn’t outgrow it. Another purpose is to prevent the puppy from having too much room, as that can lead to toilet accidents. Fortunately, these accessories are not expensive and come in all shapes and sizes, so it shouldn’t be hard to find the one that suits your needs. Many canines spend a significant portion of their day in their kennel, while their owners are running errands or working. Since every dog owner wants to keep his furry friend comfortable, getting quality bedding is of crucial importance. Fortunately, today’s market offers crate beds and mattresses that are comfortable, durable, and thick. The most expensive ones are substantially stuffed and provide a lot of support. These indestructible beds are capable of withstanding a lot of abuse, which is an invaluable feature to owners of canines that are rough with their stuff and do a lot of chewing and scratching. Dog bedding comes in lots of forms – there are flat dog mats, regular dog beds, couches, sofas, as well as pillow beds. They can be filled with various types of materials, such as foam, polyester fill, wood chips, and even with recycled clothes. No matter which type you choose, you will provide your furry mate with more room from stretching and prevent him from jumping up and down your furniture, which can lead to severe injuries. Furthermore, your dog won’t have to sleep on the flat surface of the crate, which can have a very negative effect on his postural health. Placing water and food dispensers inside the cage can be very convenient for both the dog and his owner. Your canine friend will have access to food and water at all times, and you will not have to get up and visit him every time it’s feeding time. The market offers a wide array of different models, although each of them has similar functions. The price of a particular model usually depends on the amount of food/water that it can store, as well as on its build quality and ease of operation. As you already know, large pet cages can be quite challenging to handle during the long journeys, and not all of them come with a set of caster wheels. Fortunately, there is a simple solution for such situations – using a special dolly can turn a long haul into a simple and easy thing. The best models feature a durable construction (stainless steel) and have easy-roll but rigid wheels. They also feature heavy-duty pull handles and can be easily disassembled and stored away. Getting a quality dolly will undoubtedly make your life easier if you’re a traveling dog owner. In conclusion, all we can say is that crates, cages, and kennels belong in the category of essential dog equipment. These items can be incredibly helpful since they offer a lot of benefits to both the pooch and his owner. Not only do these comfortable little houses provide your pup with safety and security, but they can also save the dog from possible danger and dramatically accelerate the in-house training process. They can also help you in teaching the puppy to the toilet at appropriate times and proper places, as well as prevent your possessions from getting damaged when you can’t monitor the dog. With so many different brands and models on today’s market, selecting just one of these handy items can be a truly daunting task. There are plastic, steel, wooden, indoor, outdoor, large, small, for travel, for anxiety, as well as heavy-duty crates. Which one of them is the ideal choice for your pup? In our short but comprehensive reviews and articles, we’ve tried to answer the question of what is the ultimate dog crate for my pet’s size, breed, and their specific needs. We’ve picked up all of the market’s most popular models and determined which ones of them are the best in their respective categories. Moreover, we’ve tried to give answers to some of the most frequent question asked by the concerned dog owners who are about to purchase their very first pet enclosure. We hope we’ve been helpful, and we wish you good luck with crate training!